Book now on the 17 December 2019 departure and save $10,700 per couple on stateroom categories 1, 2 and 3. *Prices for Children (7-18 years old) start from $16,525. Dec 17, 2019 Departure | Explore Antarctica as a Family: Choose our Dec 17 cruise for added family programming that includes exciting workshops and special excursions led by engaging A&K Young Explorers Guides. Arrive in Argentina's capital city and transfer to your hotel. Enjoy time at leisure before joining fellow travellers tonight for a welcome reception. With its wide boulevards and classical buildings, romantic and exciting Buenos Aires boasts an energy all its own. Explore its best treasures with expert A&K local guides, choosing from a selection of included excursions. Opt to explore the city on a guided tour complete with a tango demonstration; spend a full day at an authentic estancia (ranch), where you pause for an authentic lunch; or dive into a burgeoning art scene on a guided tour focused on Buenos Aires street art. Tonight, enjoy the evening at your leisure. 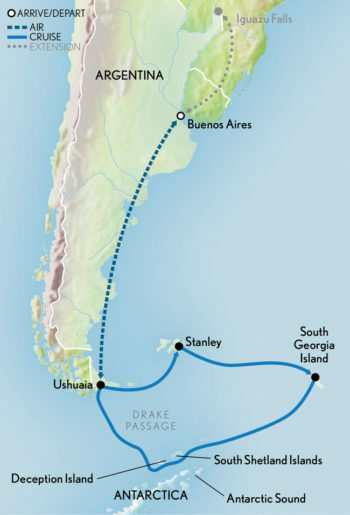 Fly to the port city of Ushuaia, located at the southern tip of South America. On arrival, enjoy lunch at the Arakur resort and, time and weather permitting, take a nature walk in the Cerro Alarken Nature Reserve, or simply relax with a cappuccino and views of Ushuaia and the Beagle Channel. Later, board 'Le Lyrial' and settle into your cabin, where you can take in views right from your own private balcony. Throughout your journey, benefit from immersive insight, with incomparable enrichment programs both aboard and on shore, and an Expedition Team that is second to none. Walk the decks and explore the common spaces as you familiarize yourself with the luxury cruiser, your home for the next 15 nights at sea. You may even want to toast to your journey in the bar with your fellow guests. As you sail east toward the Falkland Islands, your Expedition Team begins an informal series of enlightening daily discussions on the flora and fauna, geology, and history of the region. These expert lectures span diverse topics, such as seabirds and penguins of the Southern Ocean, the formation of sea ice over thousands of years, and personal accounts of living and working in Antarctica. Photography enthusiasts especially enjoy time with A&K's resident photo coach, who is on hand to share tips and answer questions. The cool waters in these parts are rich in krill, making them a favorite with local wildlife searching for food. Alongside your naturalist guides, spot various species of whales and seabirds from 'Le Lyrial's' deck. Today, 'Le Lyrial' arrives in the remote Falkland Islands. Spend the day exploring the Falklands. This may include a visit to Stanley, the tiny colorful capital of the Falkland Islands, where you may stroll its charming streets and explore its surrounding wilderness areas; or the southeast Falkland islands of Sea Lion and Bleaker, home to unspoiled wildlife habitats. As you approach South Georgia, deck-side sightings of whales and other wildlife become more frequent. Time spent cruising is once again filled with informative lectures and casual talks with your guides, leaving your knowledge of the region greatly enriched. Scan the seas to spot marine mammals and seabirds, as the ship cruises the nutrient-rich waters past the islands of Shag Rocks. South Georgia is a nearly submerged continuation of the Andes mountain range, and your days here are spent exploring its glacier-carved coves and rugged shores. While weather and ice conditions determine the schedule, stops may include Eleshul Bay to see nesting, wandering albatrosses as well as Salisbury Plain, St. Andrews Bay and Gold Harbour, all three of which are home to vast colonies of king penguins and Southern elephant seals. You may also visit Ernest Shackleton's gravesite in Grytviken alongside your onboard historian, an expert on the great explorer's life. During your time cruising the Scotia Sea — rich with marine mammals and fish — your enrichment specialists recap your adventures in South Georgia. During additional, enriching lectures, learn more about the Seventh Continent, from the terrain to the hardy wildlife that inhabits it. Ensuring your experience reaches far beyond that of everyday travellers, ongoing, informative discussions with your Expedition Team lend further context. Conditions permitting, your itinerary calls for landings on the Antarctic Peninsula and a number of South Shetland Islands, which may include Half Moon, Penguin and Deception. You may also visit Cuverville and Goudier islands, and sail through Paradise Bay and the Lemaire Channel, called "Kodak Alley" for its photogenic scenery. Further adventures may include a visit to Wilhelmina Bay, noted for its prolific humpback whale activity. As you cruise along Antarctica, scan the seas daily for these gentle giants, all from the comfort of your private balcony and the outer decks of your ship. Guests on our December 17 departure also enjoy an unforgettable New Year's Eve with a special onboard celebration to cap off a final day of exploration on the White Continent. Bid farewell to Antarctica as 'Le Lyrial' points north for her return to Ushuaia. Enjoy more opportunities to observe birds and marine life while reflecting on an incredible journey with fellow guests and new friends. Minimum age is 7 years old on the Dec 17 departure and 10 years old on the Jan 1 departure. First group event: welcome reception on Day 1. Last group event: disembarkation in Ushuaia at 9:00 a.m. on Day 18.